CDC changes stance on breastfeeding when you have the flu. From saying nursing mothers should not breastfeed or go near their babies if momma is infected with the flu, to saying mothers should breastfeed to protect their babies from becoming infected..but only AFTER the Wild Doc called them out. Should a mother stop breastfeeding while sick? This is a question that I am sure a lot of new moms will ask or think of during the months or years they are breastfeeding their new babies. 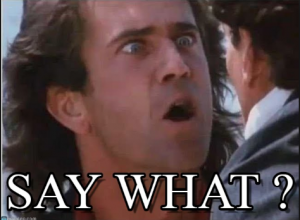 Well the CDC has shown us, yet again, that it’s recommendations are not based in science. Learn why the latest recommendations by the CDC, for mothers to separate themselves from their child may very well lead to even higher rates of infant mortality. It’s bad enough the U.S. already has the highest rates of infant mortality in comparison to all other industrialized nations. Watch the youtube video below for a more in-depth discussion on this issue. Part 2 and 3 coming soon! This was what the CDC website used to say about breastfeeding when you have the flu. 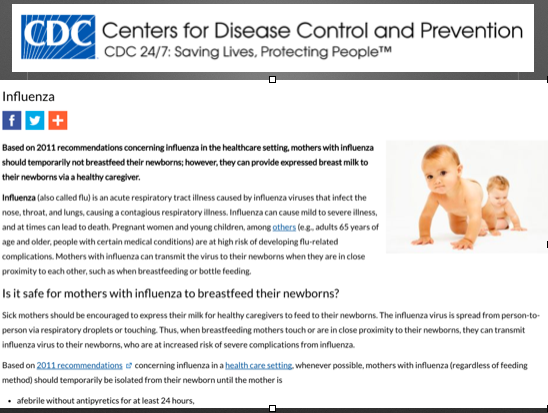 https://www.cdc.gov/breastfeeding/disease/influenza.htm **CDC website has changed and thus the original statement no longer exists. They have now changed their stance to state that mother’s with the flu should continue breastfeeding. Thankfully the CDC has started recognizing the science and beneficial effects of breastfeeding. Breastfeeding is associated with the production of type I interferon in infants infected with influenza virus. Bringing truth in a world of alternative facts.